n her classroom at Bret Harte Middle School in Oakland, teacher Sayuri Sakamoto sits at a desk piled with papers. It’s her precious prep period, and she’s in the middle of scheduling education plan meetings for her special ed students when she remembers something. “I actually need to follow up and go give someone an extra asthma treatment, like right now,” she says, as she stuffs her phone into her fanny pack and rushes out the door. Today he’s been asking to go home, but Sakamoto is hoping the extra asthma treatment will keep him at school. She walks him to a small room near the front office. “That's Nurse Williams' room,” Jayare says. But Nurse Williams isn’t here. “She's usually at her other schools," Jayare explains. That’s because nurse Natasha Williams divides her time between three schools, and a shortage of school nurses in the district means she has to pick up additional assignments, spreading her even thinner. 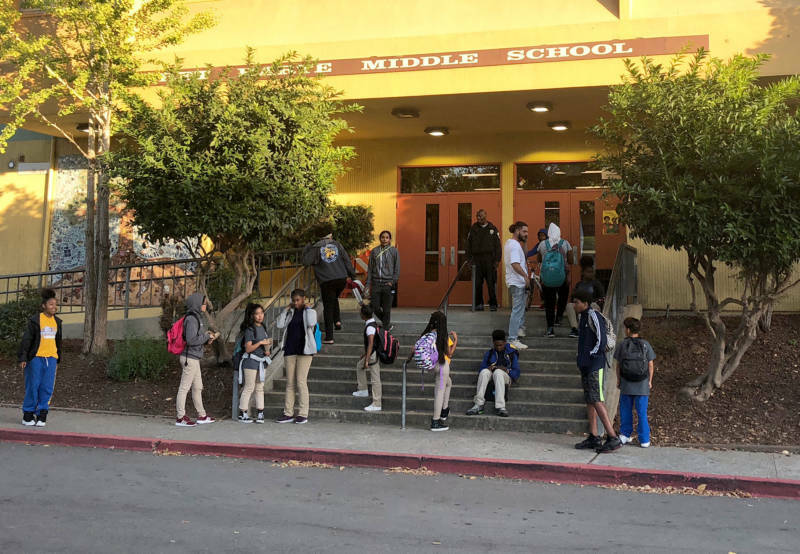 When school started this year, 10 of Oakland Unified School District’s 30 nurse positions weren’t filled. It falls to other school staff to pick up the slack. Sakamoto does her best to keep track of when students need to take medications. She sets alarms on her phone to remind her. But those alarms go off six times per day, so things can get complicated. “I have so many alarms set close to each other I'll turn one off because I think I already did that and then, 'Oh no!' It turns out that was the alarm for someone else. Sometimes schedules get way off," she says. Bret Harte principal April Harris-Jackson estimates she and her staff spend between 20-30 percent of their time on medical issues. “We could do our jobs much more effectively if we know that there are people who have training in medical emergencies and in first aid and just general knowledge, who are onsite and available to us,” Harris-Jackson says. The school’s attendance clerk, Carmen Argueta, spends so much time tending to students’ medical needs that Jayare thought she was another school nurse until Sakamoto told him otherwise. About 20 percent of students at the school receive special education services. Many of them require medical care. Harris-Jackson says she has students who regularly have seizures, others who rely on gastronomy tubes (G-tubes) and catheters, plus students with life-threatening allergies and chronic conditions that require daily medication. Nurse Williams is in charge of assessing all those students and coming up with treatment plans. She works with their doctors and trains aides and other staff, like the attendance clerk, who provide care. She also does hearing and vision tests, makes sure kids have the medications they need at school, and follows up if kids aren’t coming to class because of medical conditions. 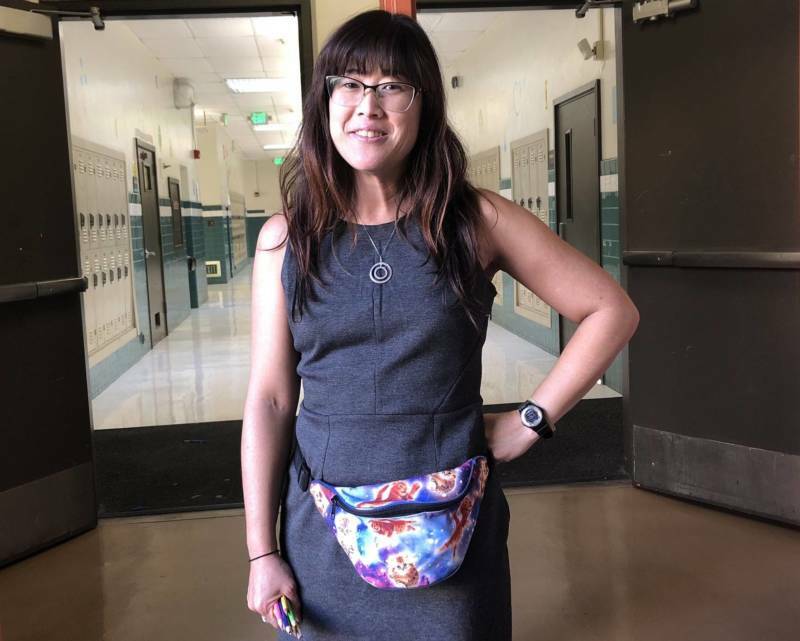 With so few nurses in the district these days, she spends two days each week at Bret Harte, but does daily diabetes rounds at other schools and takes on other assignments. In Nurse Williams’ office, Sakamoto is doing her best to meet Jayare’s needs. After rifling around in search of the binder where Williams logs treatments, she hands Jayare his inhaler. Shortly after Sakamoto sends Jayare back to class, Nurse Williams bursts through the door. She was due at Bret Harte more than two hours earlier, but she had to train the staff at another school to handle the feeding procedure. Williams loves her job and says it’s painful to see the workload take a toll on her relationship with students. 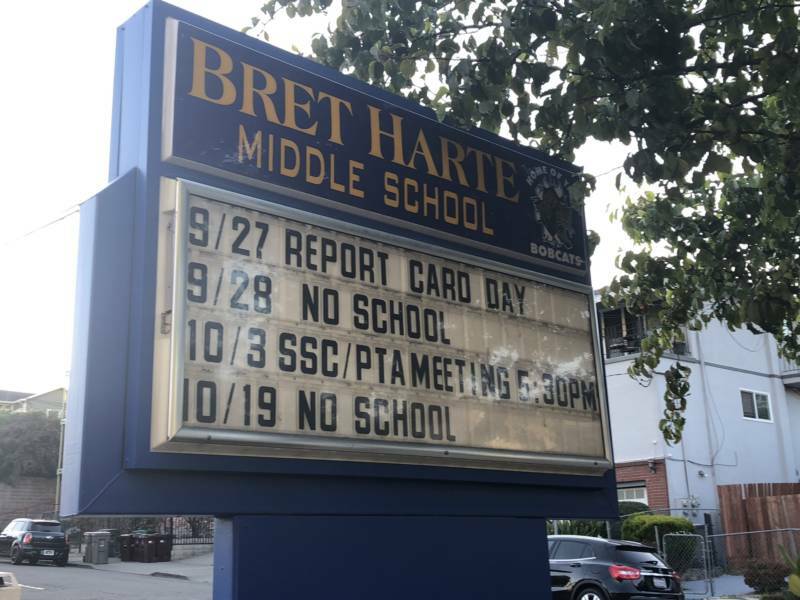 Still, Bret Harte is in some ways the district’s best-case scenario. Because it serves so many high-needs students it gets more nursing attention than some schools in the district. Around 30 schools don’t have a nurse assigned to them at all. It falls to managers in the district's Health Services Department and nurses like Williams, who already have brimming caseloads, to assess students and train staff at those schools between other work. Teachers, attendance clerks and other staff are left to manage much of students’ day-to-day care. The situation in the district has school nurses turning to their union, the Oakland Education Association, for help. In May the union filed a formal grievance accusing the district of violating the terms of their contract, which sets a nurse’s maximum caseload at 1,350 students. Even without the extra tasks thrown her way, Natasha Williams oversees nearly 1,400 students at her three schools. In addition to monitoring medical services for severely disabled students and kids with medical conditions from cancer to cystic fibrosis, Nielsen Boyd has dealt with mental health issues like panic attacks and self-harm. She’s also the school’s go-to in emergencies. And with nurses so scarce she sometimes gets pulled away to help at other schools. When the district did not respond to the nurses’ initial complaint, the union tried again. In late August the district rejected the grievance, saying it wasn’t filed in a timely manner, and deemed it null and void. The union and district have yet to work out a solution. In the meantime, nurses have turned to other tactics. At a School Board meeting in late September, they showed up alongside teachers to demand the district address the shortage. They provided board members with statements they said they’d collected from parents and pediatricians. District-wide, there are over 700 students with severe allergies, more than 350 students whose asthma requires regular medication, about 200 students with seizure disorders, 50 students with diabetes and nearly 30 students with sickle cell disease. “It's a high-needs district. We take great pride in filling the medical needs for our kids,” says OUSD spokesman John Sasaki. He points out the district has a vision clinic and dental services, along with independently run general health clinics families can access at over a dozen schools. Sasaki says in the past five years, several school nurses have retired while others have left for other districts or taken hospital jobs. The number of full-time credentialed school nurse positions in the district has dropped over time, and so have the number of unfilled positions. Last school year, the district had 32 nurse positions, six of them unfilled. In 2015, there were about 35 positions and only three were unfilled. While some nurses say the district hasn’t done enough to recruit nurses, district officials peg the unfilled positions on a shortage that stretches beyond Oakland. In fact, across the state, about ten percent of school nurse positions are unfilled, according to Sheri Coburn, president of the California School Nurses Organization. Coburn blames the shortage in part on the fact that nurses can make more money in traditional hospital settings. School nursing also requires specialized training that takes time and money. He says staff is working to expand the nurse recruitment campaign and the district is working with the union to offer additional incentives, like signing bonuses, referral bonuses and stipends for experienced nurses who support and mentor newer nurses. Studies have shown kids who have access to school nurses do better than those who don’t — they’re absent less, and their teachers can dedicate more time to teaching. The American Academy of Pediatrics recommends a minimum of one full-time school nurse at every school. In California, on average, there’s one school nurse for every 2,500 students.